← Winter Advisory on the First Day of Spring! Sometimes while we are hiding out from storms the waters are actually calm enough for me to work. It hasn’t been often! On good days, we tend to set off sight seeing and shell collecting, but on others I manage to get a bit of work done! 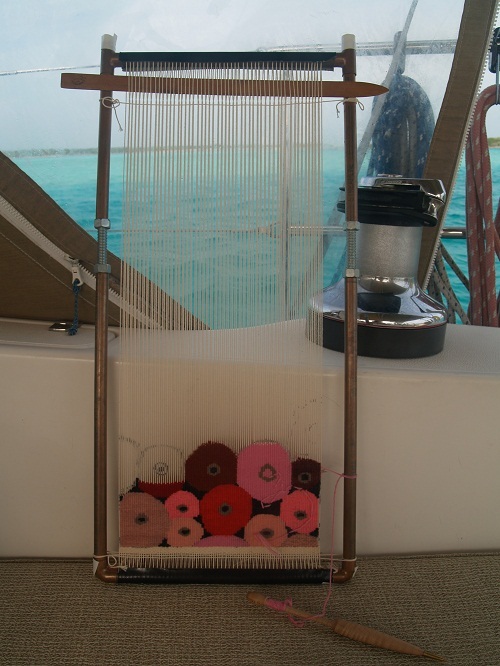 I started my tapestry idea (a shelf of spools) a few weeks ago by doing some sampling, and learned a lot by the time I unwove the whole thing. I’d done about eight spools at that point and had worked out that I wanted the circles to be all different sizes and different shapes, and the little cardboard tubes and empty space inside the tubes to be fairly (but not perfectly!) consistent. This is the first tapestry I am making without a cartoon! …. it is very freeing! Archie Brennan is always talking about the ‘open journey,’ by which he means not making too many decisions ahead time, letting the work at hand determine what should come next, and this is my first attempt at that. I’m doing the same with color choice, choosing colors based on what has just been done. Naturally, I wish I had a lot more choices onboard with me, but so far I have not been disappointed to make do with what I have. I am facing my blank warp and creating as I go. I do ink on a freehand circle or two before I weave, and each circle I draw is based on the circles that have come before them, and each color choice for the circles is based on the colors I’ve already used as well as the loose ‘plan’ of where I hope to go. This is really a fun journey…..I would call it a tapestry vacation! A little side trip along an untraveled road (for me) with lots of beautiful scenery! A playland! 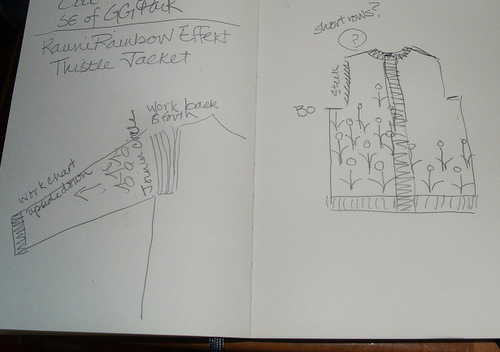 My other big project onboard is a sweater that was posted on Pinterest with a link to Ravelry. 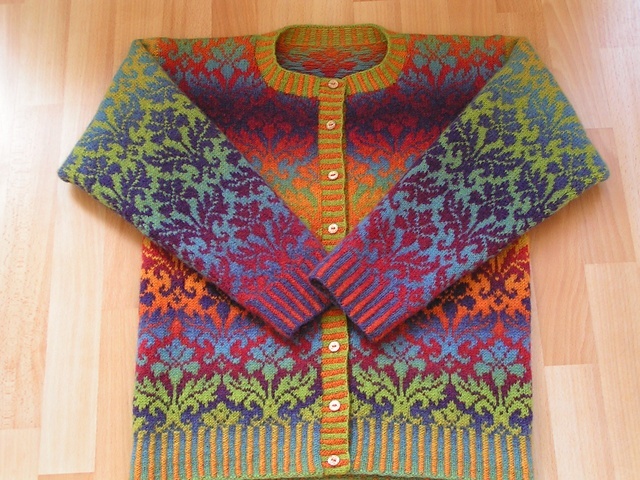 When you click on the floral sweater photo on Pinterest you get directed to this sweater on Ravelry. The floral sweater is far more appealing to me than the little squares version! 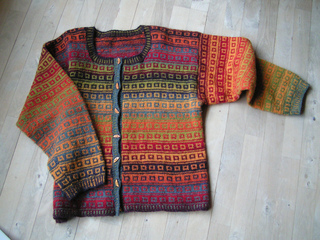 Finding the origin of this sweater was a bit challenging, but when I get focused on something I can be a bit maniacal. After doing a gauge swatch and determining that I’d use 10 repeats of the thistle pattern for the body, I cast on for corrugated rib and steeked the front opening, and have just been zipping along up to the armholes. Now I am at the armhole openings and thought I’d better make a plan. While traditional Fair Isle construction makes for such easy knitting, it is not the most flattering look on me. I look better in sweaters that have a bit of armhole shaping, and even more importantly I need sloped shoulders. These two issues that are quite important to me will necessitate some fiddly knitting. Here is my sketch. If there are any knitters out there reading this, please weigh in on what you’d do if you were making this sweater! I could use some input! Cabbage, which I hardly ever eat at home, is quite a staple down here, and it always brings back great memories of cooking in college with my brand new edition of the Moosewood Cookbook. 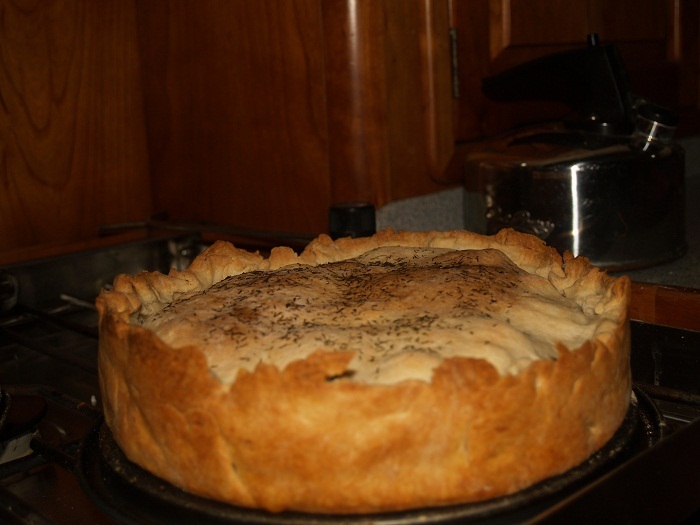 It had a catchy name I no longer remember, but I do remember that the Russian cabbage pie was one of my favorite meals from that book. Thank you, Molly Katzen! I’m sure I could have googled the recipe if only I had internet. Since that was not an option, I had to do the best I could on memory alone. I remembered the pastry crust had cream cheese as well as butter. So I made a crust with 4 TB butter and 4 oz. of cream cheese. I made 4 hard cooked eggs, sautéed the mushrooms and set them aside to sautee the cabbage that had been salted and left to wilt for about 20 minutes. I seasoned everything liberally with dill and a little salt and pepper. I layered all this in my pie shell, along with the other 4oz of cream cheese left in the brick. Since I do not have a pie dish onboard I made this dish in my 9” springform pan. It has come in very handily as a substitute for many other pans. I’m glad to have it with me! Dinner was delicious! Who knows how far from the original I have strayed, but we enjoyed it just the same! It does take a bit of doing to make something like this on a boat in a galley that is smaller than a NY City apartment kitchen. If not for the space it takes to pre-cook all the separate parts of this dish, I would definitely say this would become a staple meal on Pandora. It may become a staple in spite of the space challenge! This entry was posted in inspiration, knitting, patterns, tapestry. Bookmark the permalink. That cabbage pie looks spectacular. I too cook when I’m bored, even on land, but most definitely while cruising. I never thought to take a spring form pan though. But I’ve found amazing uses for my silicone bundt cake pan! 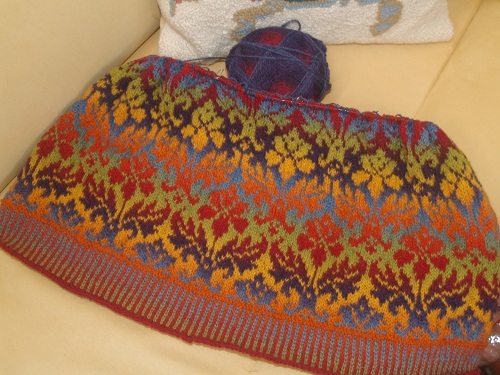 Re the knitting, Pinneguri participates all the time on the Stranded Group Forum, and I recognize the cardi as her pattern. She is so creative and accomplished I’m sure she would have a suggestion as to how to slope the shoulders. I’m crazy enough that I’d do it with short rows knitting back and forth, but it’s not the most fun way and maybe not the best. It’s ingenious. I just started knitting the Versio top using that method.